Lunch with Buddha is a must-read if you enjoyed "Breakfast with Buddha"! Otto is on another road trip with the Buddhist monk who is now his brother-in-law of six years. The trip is more than physical as Otto grapples with his family's upheaval. In spite of difficult issues there is still plenty of humor mixed in with spiritual and intelligent ponderings. On the surface, LUNCH WITH BUDDHA is a story about family. Otto Ringling and his sister Cecelia could not be more different. He's just turned 50, an editor of food books at a prestigious New York publishing house, a man with a nice home in the suburbs, children he adores, and a sense of himself as being a mainstream, upper-middle-class American. Cecelia is the last thing from mainstream. For two decades she's made a living reading palms and performing past-life regressions. She believes firmly in our ability to communicate with those who have passed on. It will turn out, though, that they have more in common than just their North Dakota roots. 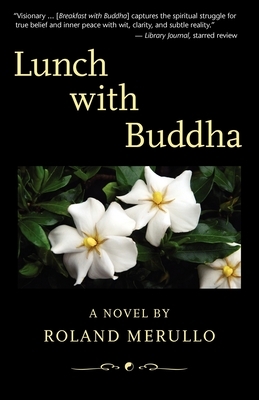 In LUNCH WITH BUDDHA, when Otto faces what might be the greatest of life's difficulties, it is Cecelia who knows how to help him. As she did years earlier in this book's predecessor, BREAKFAST WITH BUDDHA, she arranges for her brother to travel with Volya Rinpoche, a famous spiritual teacher - who now also happens to be her husband. After early chapters in which the family gathers for an important event, the novel portrays a road trip made by Otto and Rinpoche, in a rattling pickup, from Seattle to the family farm in North Dakota. Along the way the brothers-in-law have a series of experiences - some hilarious, some poignant - all aimed at bringing Otto a deeper peace of mind. They visit American landmarks; they have a variety of meals, both excellent and awful; they meet a cast of minor characters, each of whom enables Rinpoche to impart some new spiritual lesson. Their conversations range from questions about life and death to talk of history, marijuana, child-rearing, sexuality, Native Americans, and outdoor swimming. In the end, with the help of their miraculous daughter, Shelsa, and the prodding of Otto's own almost-adult children, Rinpoche and Cecelia push this decent, middle-of-the-road American into a more profound understanding of the purpose of his life. His sense of the line between possible and impossible is altered, and the story's ending points him toward a very different way of being in this world.